Steel building failures are most often caused by deficient connections. This prompts us to systematically study joints in all of our projects (see our welding page). AISC, ECCS and other steel specifications allow us to make precise calculations in order to evaluate the resistance and the rigidity of connections. 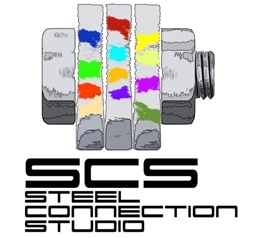 Mech Studio proudly uses SCS - Steel Connection Studio as Connection Design Software for designing structural steel joints. To whom could this specialized service be useful? Structural Engineers who design the general steel frame, then hand it off to Mech Studio to complete the connection design. Fabricators can use Mech to design connections before final detailing, using the fabricator's preferences, so that detailing can proceed smoothly, quickly, and in the proper style. Our ability to design connections is an added value that offers customers complete and qualified support from design to fabrication. You can trust the detailing job to Mech and be confident that any necessary connection design can be done in-house with care and accuracy. For example: in a moment frame, Mech Studio would consider the ultimate limit states of the joints in order to define diameter, number, spacing and edge distance of bolts, plate thickness, material, stiffener utility, dimensions, pattern, and constructability (would doubler plates create problems for zinc coatings?). We would analyze design issues such as end plate yielding, bolt rupture with or without prying action, panel zone shear strength, local column flange bending, local column web yielding and crippling, and compression buckling of the column web. For a free estimate or to arrange a meeting please leave your name, the name of your firm, your position in the firm, telephone number and the information you require . You will be contacted within three working days.